Somewhere around 1978 Lar Kar-Leung, veteran stuntman, actor, and fight choreographer was unhappy with the way that martial arts films were portrayed onscreen, and set about to do a film that would show the philosophy and logic behind the movements. 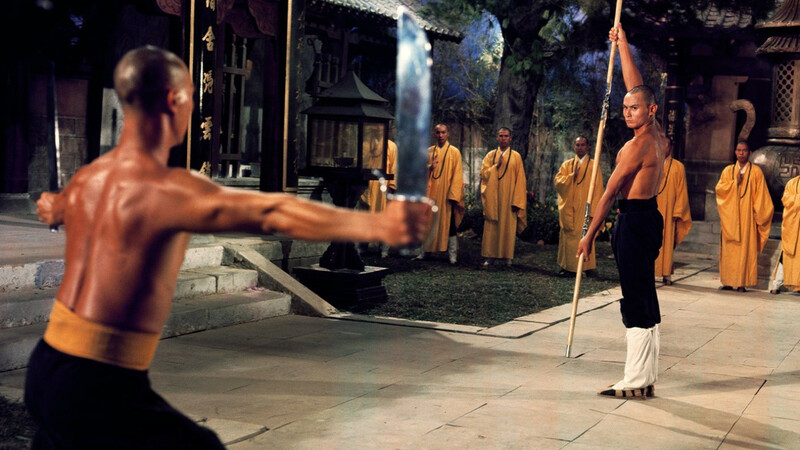 With the help of his Kung-Fu brother Gordon Liu, they would craft a tale of revenge and enlightenment within the form of something that wasn’t well represented in film at the time: Shaolin Kung-Fu. Thus the 36th Chamber of Shaolin was born, and a new gold standard would be created. The opening of this film alone, showing Gordon Liu going through the forms is one of the best scenes of this ever. Other films did it before, but this one did it the best. The film is at its core one giant training film, and as San Te’s skills grow so does his maturity. The chambers are each magnificent for what they show, particularly the first chamber, the Dining Chamber, where he must make his way across a set of wooden logs floating in a pool of water in order to get to the other side, where dinner awaits. When he falls in he finds he is unable to enter the dining hall until he is dry, but in the time it takes for his clothes to dry the food is eaten up. It is here that one of best lessons for any aspiring martial artist is learned. San Te must master stances, balance and movement here, the foundations of any style one studies. Without that, your skills can never improve. San Te then does the most important thing anyone can do who looks to becoming a great martial artist… PRACTICE. Only through practice can you reach your full potential, and it is the constant practice that enables San Te to become successful and get past that chamber, as well as all of the others. The other chambers are brilliant, especially the wrist chamber (painful!) and the staff chamber. You can see San Te’s skills grow as he goes along, mastering each one. Look for the great Simon Yuen (Drunken Master) as the monk who is in charge of the Boxing Chamber. 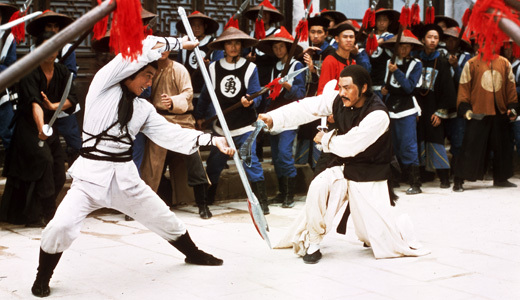 The best series of fights occur after these scenes, as the skeptical Justice Abbot challenges San Te to a fight with whatever weapon San Te chooses, and each time the Abbot uses a pair of Butterfly swords. The fights here are choreographed masterfully, as San Te is defeated again and again, until he ponders the fights and invents the 3-section staff, which he uses to defeat the Justice Abbot in the best fight of the bunch. The movement and choreography are in great sync here, and both Liu and Hoi Sang Lee do a fantastic job pulling it off. The graveyard fight is also a stand out as it shows San Te’s skills in relation to the training he’s undertaken. Everything he does makes sense, and the audience knows exactly why he makes the moves that he does because of the training sequences earlier in the film. Gordon Liu became a star with this film, and it’s not hard to see why. He plays a great San Te, able to show his immaturity and the beginning of the film and then his maturity toward the end, even as he sees his revenge standing right in front of him. He fights for the people, not for revenge, and Gordon is able to embody this brilliantly. Lau Kar-Leung’s camera work is fantastic, and the composition of each scene is incredibly well done. The camera shifts exactly where it should to showcase the fights in the best manner, pulling back when it needed to and to get closer when it was best, and you always know the space between fighters and their relation to the environment. The 36th Chamber is a kung-fu classic, considered one of the greatest of all time, and with good reason. All of the parts come together beautifully to form a great cinematic experience. Gordon Liu would become a huge star after this, and Lau Kar-Leung would cement his place as one of the best fight choreographers and kung-fu film directors ever. CHOREOGRAPHY: (10) Not a bad fight in the bunch, and simply gets better as the film goes along. Lau Kar-Leung went into a very deep bag of tricks for this one, and they all worked. The speed and complexity of the choreography is astounding. As good as it gets. STUNTWORK: (8) These guys do a pretty good job. Nothing death-defying, but well done. STAR POWER: (9) Gordon Liu became a big star after this, and Lar Kar-Leung jumped to the top of the heap as a director. Lo Lieh is as good as always, as was John Cheung. FINAL GRADE: (10) One of the greatest kung-fu films of all time. The gold standard many would, and should be judged by afterward. If you want to introduce someone to the world of martial arts in film, this is where you want to start. Previous Xing Yu finally gets his shot at the big time! Wrath of Vajra Trailer!! Next Farewell, Lau Kar Leung. Definitely one of the classics. What I liked about the Chambers was the amount of thought that had gone into them – the first ten had nothing to do with kung fu (directly) – they were all about honing the body to a point where the disciples would have the strength and stamina to build upon. That’s the reason Lar Kar-Leung wanted to make this film. He wanted to show how a true martial arts practictioner has to train to be as good as he becomes. Even in my class the foundations are important: stances, conditioning, breathing, concentration. San Te doesn’t becomes great overnight. He needed to learn the basics before he even learned how to fight. This film is pure greatness.